The success of your campaign on Yandex.Direct isn't just a matter of creating an attractive ad. It is also a question of reaching users who can actually respond to your ads if interested. Users are generally interested in goods and services located in the regions where they live or plan on visiting. Using geotargeting, you can ensure that you are reaching customers in your region. Tutorial video. How to set up geotargeting. Where can I configure display regions? Geotargeting refers to the technology which allows you to control the geography of your ad impressions. Yandex.Direct ads will only be served to people that can actually make use of your offer (either because they are located in the region you selected or are interested in that region). So if you only deliver pizza in Kursk, select Kursk as your display region in your campaign or ad group settings. The Extended geotargeting option will be enabled by default in the settings of new campaigns. This option functions on both Yandex search and in ad networks. It does not influence ads served on YAN search sites (including search results pages for Yandex.Maps, Yandex.Market and other Yandex services). Limitations of extended geotargeting. The extended geotargeting option allows you to serve your ads when users type in searches that include the name of your display region, regardless of their actual location. Yandex automatically determines the region of interest expressed in the user's query. The system takes informal and shortened variants of region name into account (e.g. NYC, MSK, Chi Town) when determining the region. When extended geotargeting is enabled, it triggers the system to compare the region in the search query with the region you indicated in the settings for the ad or campaign. If the regions match, the system knows that the user is looking for goods or services like yours in your area. However, if you use one region in your keywords while extended geotargeting is enabled and set a different region in your ad settings, then your ads will not be served on search results pages if a user enters those keywords. In this case, you would need to disable extended geotargeting in order to start serving your ads in search results. To find out exactly where users will see your ads based on different geographical settings, take a look at this table. For example, if you want to serve ads for an amusement park in Moscow, enter amusement park as the keyword and set Moscow as the display region. That way, your ads will be served to Moscow residents who search for amusement parks as well as people in other regions who search for amusement parks in Moscow. However, let's say you created a special campaign for potential clients from Tver, entered the keyword amusement park Moscow and set the display region as Tver. In this case, the region listed in the keyword does not correspond to any of the selected display regions, so your ad will not be served if extended geotargeting is enabled. To start serving these ads, you must disable extended geotargeting in the campaign settings. *The location of the user seeing the ad is compared with the display region in the ad or campaign settings. The location of a user of Yandex search, a network app, or visitor to a network site is determined by Yandex location settings or by IP address to be located within the display region. **If a larger display region from the ad settings or campaign settings includes a smaller region from the keyword, the system considers these regions as matching (for example, Russia and Moscow). For example, you create an ad campaign for an amusement park. Ads are moderated in accordance with the rules of the country that includes your display regions. Any legal restrictions on advertising that exist in the country where your ads are served will apply. An ad that passes moderation might not be served in a specific region due to local advertising laws. Extended geotargeting allows you to serve ads to a user taking into account the location they frequent, regardless of where they are currently located. Frequented locations are determined with the use of Crypta technology on the basis of how frequently the user is in a region chosen by you. When selecting a region, data from the last 90 days is taken into account. When enabled, the system receives a signal to compare the region of a location frequented by a user with the region you have specified in your ad or campaign settings. If this data matches, the user will see an ad for your product or service. For example, you have created an ad campaign for your car showroom in Moscow and have set the display region as Moscow. Your ad will be served not only to users who are located not only in Moscow, but also to Moscow residents who are interested in purchasing a car, but are away in Tomsk on business. You can select regions for a campaign (in the section Geotargeting → Display regions in the campaign settings) or for an ad group (in the section Display regions on the ad group creation and editing page). By clicking the flag next to the name of the region, you select the whole region including all the towns within it (even if they are not shown separately in the region tree). If you have selected different regions for different campaign groups, then Russia will be the display region selected by default for a new group. The Extended geotargeting option can be configured inthe Geotargeting section of the campaign settings page. To quickly launch ads with geotargeting, simply create a campaign and choose the specific display regions in which your goods or services are offered. Extended geotargeting will be enabled by default for this campaign. If you would like to use keywords that feature the names of regions, as is common in ads relating to travel, tourism, hotels, or medical services abroad, disable extended geotargeting. To find out exactly where users will see your ads based on different geographical settings, take a look at this table. Waiting several days after your ad impressions begin will give Yandex.Direct time to collect statistics about the number of impressions and clicks in different regions. If the reports show that the regional distribution of clicks is uneven, it's best to carefully reconfigure your regional display settings. Analyzing the impression and click statistics, you may discover that user reactions to your ads differ by region. creating a new ad in your campaign specifically for display in Moscow (including Moscow region). creating a separate campaign specifically for display in Tver (extended geotargeting disabled, keyword amusement park Moscow, and Tver as the display region). Dividing ad campaigns by region will help you better manage your bids and conserve your budget. When setting bids in one region you don't need to take another region's competition into account. You can view the impressions forecast for a specific region in the Wordstat form. Extended geotargeting settings are ignored for ads in certain categories. Travel and leisure (such as hotels, bus tours, trip packages, transit tickets, children's camps and day trips, vacation reviews, and vacations themselves). Categories that require specific documents in order to advertise (such as medicines, medical devices and services, pharmacies, dietary supplements, detective work, pyrotechnics, finances, insurance, and items resembling weapons). If your ad belongs to one of these categories, it will only be displayed in the regions you set in the campaign or ad group settings. The ad category is determined automatically based on its content (such as the title, text, and sitelink descriptions) and the landing page. Extended geotargeting settings are ignored for advertisements, the placement of which requires the provision of certain documents (for example, advertising medicines, medical goods and services, pharmacies, dietary supplements, detective work, pyrotechnics, financial services, insurance, or products similar in construction to weapons). 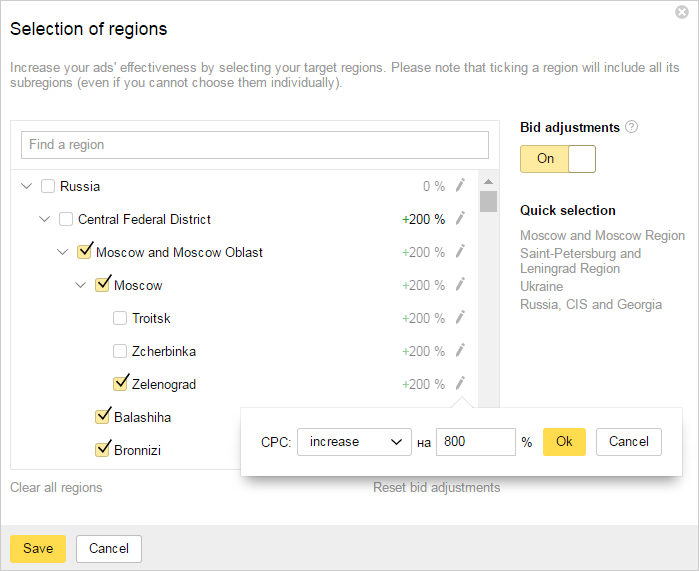 Regional bid adjustments allow advertisers to increase or descrease CPC when showing ads to users in specific regions. Yandex.Metrica reports can help you determine the best bid adjustments and the best times to use them. Regional bid adjustments can be set at the campaign level, but not for ad groups. To do this, enable bid adjustments in the display region settings and set coefficients for the regions you are interested in. 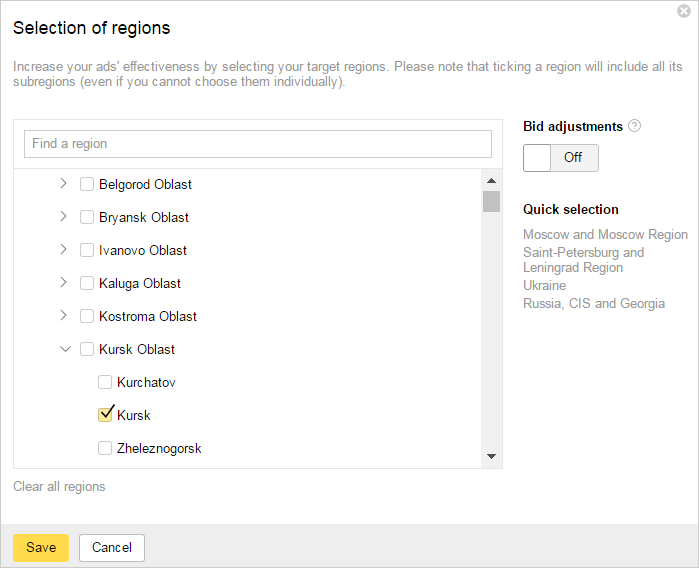 By setting regional bid adjustments, you automatically set the bid for all subregions included in that region. These values will be highlighted in gray. Automatically-set values can be manually changed at any time. Values entered manually will be highlighted in black. Leave this field empty and the automatically-set bid adjustment values will return. The minimum bid amount when factoring in the coefficient is 90% less than the original CPC. The maximum bid is equal to the original CPC plus 1200%. For example, you're using an automatic strategy. Your maximum bid is set at 20 rubles per click and your coefficient for impressions in Kursk is set to “increase by 100%” (so that the adjusted bid will be 40 rubles). In this case, impressions in Kursk will display at the 40 ruble bid rate. Regional bid adjustments do not affect how extended geotargeting works. For example, let's say you want the keyword amusement park to trigger your ads for an amusement park in Moscow and your bid is 20 rubles. You set a coefficient to increase your bids for ads served in Moscow by “100%” (so that the adjusted bid is 40 rubles). If extended geotargeting is enabled, then a 40 ruble bid may be used when a Moscow-based user enters amusement park or a user outside of Moscow enters amusement park in Moscow. You can apply several coefficients to a given bid at once (region, mobile impressions, gender and age, time of day and so on).